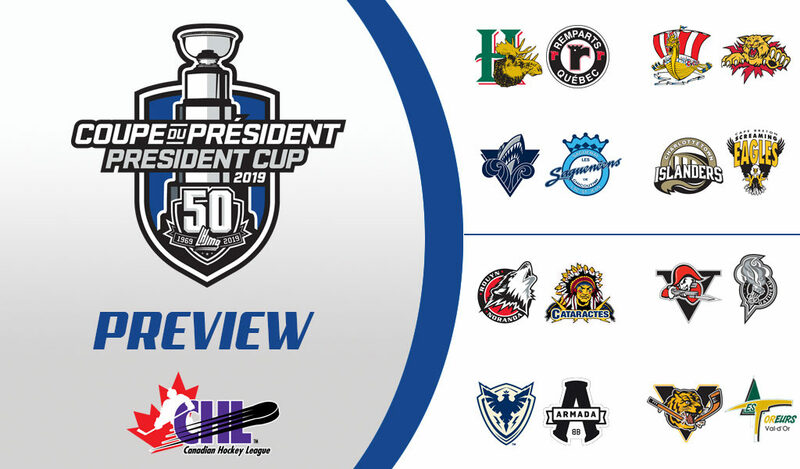 The Mooseheads have a guaranteed spot in this year’s Memorial Cup as the host team, but will still want to remain competitive before battling it out for the national crown. The squad plays a tight defensive game, as evidenced by its second-best goals against figure and its league-leading penalty kill. Between the pipes, Chicago Blackhawks prospect Alexis Gravel has put together an impressive 33-win campaign, which ranks second-best among all QMJHL netminders. Special teams are a big part of Halifax’s success, including a power-play unit that sits second league-wide and is led by Samuel Asselin. The overage forward led the entire QMJHL with 48 goals, while his 14 power-play markers trailed only Moncton right-wing Jeremy McKenna for top spot. There’s also third-year skater Raphael Lavoie, a key cog in Halifax’s offensive machine who projects to be a first-round pick in the NHL draft come June. Still, the Mooseheads will have their work cut out for them against a well-balanced Remparts squad that took both games in their season series, which included a five-point effort by left-wing Louis-Filip Cote during an early October meeting. The Wildcats will need to keep the infractions to a minimum in going up against the Drakkar, who own the QMJHL’s best power-play unit, firing at better than 30%. Working in the Wildcats’ favour, however, is that the team brings a strong penalty-killing group of its own that is bested by only two clubs league-wide. Meanwhile, the first-round matchup will also see two of the CHL’s best up-and-comers go head-to-head in Baie-Comeau blue-liner Nathan Legare and Wildcats left-wing Jakob Pelletier, both of whom competed in this year’s Top Prospects Game. In all, the Drakkar and Wildcats are not overly familiar with each other, having only met up twice in the regular season, and ultimately splitting the season series one game a piece, meaning the two squads could feel each other out before amping up the playoff pressure. A key contributor to the series could be Moncton defenceman Jordan Spence, whose 49 points ranked in the Top 10 league-wide and led all rookie rearguards. The freshman picked up one goal and two assists in two games versus the Drakkar this season. Despite finishing lower in the standings, the Sagueneens took the season series against the Oceanic and will look to do the same in the playoffs. Repeating that performance won’t come easy though, as the Oceanic will have a few key talents ready to star on the big stage. 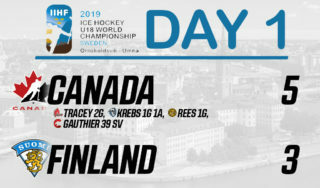 Chief among them is second-year sensation Alexis Lafreniere, the team’s leading scorer and likely top pick in the 2020 NHL Draft. The 17-year-old wrapped up the season with 105 points, second to only Rouyn-Noranda centre Peter Abbandonato. Lafreniere finished last year’s postseason at a point-per-game pace as he put up seven points in seven games, while he stands a good chance to put up an even better performance this spring. In the blue paint, draft-eligible netminder Colten Ellis, who starred in this year’s Top Prospects Game, will be ready to put on a show ahead of the NHL draft in June. To do so, he’ll have to hold off another budding up-and-comer in Chicoutimi defenceman Artemi Kniazev, whose seven power-play goals finished in the top three among all QMJHL blue-liners. Game 1, Fri., March 22 at Rimouski – 7:30 p.m.
Game 2, Sat., March 23 at Rimouski – 4:00 p.m.
Game 3, Tues., March 26 at Chicoutimi – 7:30 p.m.
Game 4, Wed., March 27 at Chicoutimi – 7:30 p.m.
*Game 5, Fri., March 29 at Rimouski – 7:30 p.m.
*Game 6, Sun., March 31 at Chicoutimi – 4:00 p.m.
*Game 7, Tues., April 2 at Rimouski – 7:30 p.m.
Two Maritimes Division foes will battle it out in the first round in the Islanders and Screaming Eagles, who saw each other eight times this season and now have at least another four matchups on the docket. Interestingly enough, both squads enter the postseason playing some of their best hockey, as the Islanders have won 10 of their past 13 appearances, including back-to-back victories over Cape Breton, while the Screaming Eagles are riding a three-game win streak and have suffered just two regulation losses in their past 10 outings. In hopes of a long playoff run, the Screaming Eagles were active at this year’s trade deadline, adding forward Derek Gentile from the Islanders, while Minnesota Wild prospect Shawn Boudrais was acquired from the Gatineau Olympiques to complete an offensive attack led by overage forward Mitchell Balmas, who won the Memorial Cup a year ago as part of the Acadie-Bathurst Titan. Meanwhile, the playoffs will be the latest test for Charlottetown’s Nikita Alexandrov, who is eligible for this year’s NHL draft. The German-born forward impressed in last year’s postseason as he put up seven goals and 10 assists in 18 games. 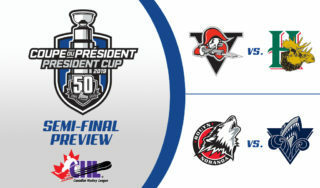 The Huskies have their sights set on a franchise-first Memorial Cup, in addition to their second President’s Cup win in the past four years, but will first need to go through Shawinigan, who grabbed the final playoff berth in the regular season’s final weekend. 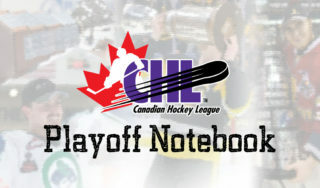 The two sides were separated by 86 points in the regular season, so an abbreviated series is likely a fair expectation, especially given the high-flying Huskies tied a CHL record with a 25-game win streak. Up front, the Huskies are led by overage forward Peter Abbandonato, who finished the year with 111 points and claimed the Jean Beliveau Trophy as the league’s top scorer. Rouyn-Noranda is just as dominant between the pipes with the duo of Samuel Harvey and Zachary Emond. A San Jose Sharks prospect, Emond appeared in 27 games and went the entire season without suffering a regulation loss. In all, his only blemish came in a shootout defeat to the Sherbrooke Phoenix in mid-December. Defenceman Noah Dobson, a first-round pick by the New York Islanders a year ago, hopes to challenge for another Memorial Cup after winning it all with Acadie-Bathurst last season. Game 1, Fri., March 22 at Rouyn-Noranda – 7:30 p.m.
Game 2, Sat., March 23 at Rouyn-Noranda – 7:00 p.m.
Game 3, Tues., March 26 at Shawinigan – 7:00 p.m.
Game 4, Wed., March 27 at Shawinigan – 7:00 p.m.
*Game 5, Fri., March 29 at Shawinigan – 7:30 p.m.
*Game 6, Mon., April 1 at Rouyn-Noranda – 7:00 p.m.
*Game 7, Tues., April 2 at Rouyn-Noranda – 7:00 p.m.
No QMJHL team found the back of the net more often this season than the Voltigeurs. Led by Detroit Red Wings prospect Joseph Veleno, who trailed only Rouyn-Noranda’s Peter Abbandonato by just seven points for the league lead, the Voltigeurs have a deep offensive arsenal where four players cracked the 80-point plateau. Drummondville also keeps things tight defensively, as just two teams allowed fewer goals, with netminder Olivier Rodrigue locking it down between the pipes and tying the Huskies’ Samuel Harvey for a league-leading 35 wins. Another feather in the cap for Drummondville is the team’s win over the first-place Huskies last month to snap a 25-game win streak that was just one shy of setting a CHL record. Meanwhile, after coming up short with Team Canada at the world juniors, look for Drummondville forward Maxime Comtois to come up big in the postseason. The Anaheim Ducks prospect enters the playoffs on an impressive clip as he’s picked up 24 goals and 10 assists in his past 17 appearances, a stretch which included a goal in a 7-0 blowout of the Olympiques. Game 1, Fri., March 22 at Drummondville – 7:30 p.m.
Game 2, Sat., March 23 at Drummondville – 7:00 p.m.
Game 3, Tues., March 26 at Gatineau – 7:30 p.m.
Game 4, Wed., March 27 at Gatineau – 7:30 p.m.
*Game 5, Fri., March 29 at Drummondville – 7:30 p.m.
*Game 6, Sun., March 31 at Gatineau – 4:00 p.m.
*Game 7, Tues., April 2 at Drummondville – 7:00 p.m. The Phoenix are led by Samuel Poulin, the son of longtime NHLer Patrick Poulin whose career spanned more than 600 games. With Sherbrooke this season, Poulin put up a career-high 76 points, which bodes well for his selection in the NHL draft come June. Heading into the postseason, Poulin and his Sherbrooke teammates face off against netminder Brendan Cregan, who played part of three seasons with the Phoenix prior to his trade to the Armada in early January. Cregan has suited up against his former club three times since the deal, coming away with one win and a .906 save percentage. Meanwhile, the Phoenix will also need to get back to their winning ways if they are to challenge in the postseason after winning just two of their final 10 games to close out the regular season. It’s been the opposite story for the Armada, who have found the win column in six of their past 10 outings. Armada defenceman Samuel Bolduc, who starred in this year’s Top Prospects Game, will have his latest opportunity to shine on the big stage as Blainville-Boisbriand looks to upset Sherbrooke. Game 1, Fri., March 22 at Sherbrooke – 7:00 p.m.
Game 2, Sat., March 23 at Sherbrooke – 4:00 p.m.
Game 3, Tues., March 26 at Blainville-Boisbriand – 7:00 p.m.
Game 4, Wed., March 27 at Blainville-Boisbriand – 7:00 p.m.
*Game 5, Fri., March 29 at Sherbrooke – 7:00 p.m.
*Game 6, Sun., March 31 at Blainville-Boisbriand – 3:00 p.m.
*Game 7, Tues., April 2 at Sherbrooke – 7:00 p.m.
It’s been a sensational season for rookies with the Tigres. Leading the pack is Egor Serdyuk, whose 65 points not only sit atop the Victoriaville squad, but also rank first among all QMJHL first years. Then there is teammate Mikhail Abramov, who has also shined in his first year in North America and who is considered a top prospect for this summer’s NHL draft. A first-round series against the Foreurs looks to be an evenly matched affair and could come down to a goaltending showdown between Victoriaville’s Tristan Cote-Cazenave and Val-d’Or goaltender Jonathan Lemieux. It was a busy season for Cote-Cazenave, who appeared in 42 games while finishing in the top four in both goals-against average and save percentage. As for Lemieux, the budding netminder enters the postseason riding an impressive streak that has seen him come away with a victory in nine of his past 12 appearances, including an overtime win against the Tigres in early January in which he put up a 28-save performance. Like teammate Maxence Guenette, Lemieux is also a consideration for the 2019 NHL Draft. 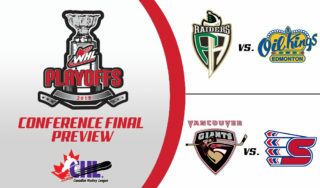 Game 1, Fri., March 22 at Victoriaville – 7:00 p.m.
Game 2, Sun., March 24 at Victoriaville – 3:00 p.m.
Game 3, Tues., March 26 at Val-d’Or – 7:00 p.m.
Game 4, Wed., March 27 at Val-d’Or – 7:00 p.m.
*Game 5, Fri., March 29 at Val-d’Or – 7:00 p.m.
*Game 6, Mon., April 1 at Victoriaville – 7:00 p.m.
*Game 7, Tues., April 2 at Victoriaville – 7:00 p.m.